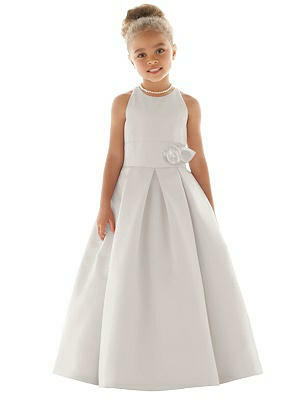 Your smallest attendant will show up the wedding party when she dons this sleeveless matte satin flower girl dress. A full back and wide waistband offers a flattering fit, and hand worked flower detail shows off the beauty of a full pleated skirt. Fit Tip: The natural waist and bust measurement take priority for style FL4058. If you are over by an inch or two on the hip it is not a problem. There is plenty of extra room in the skirt to accommodate. If you would like help choosing your size, please contact a Dessy stylist.